As you know, BORLA has long been associated with providing quality exhaust systems that offer increases in both performance and sound quality. 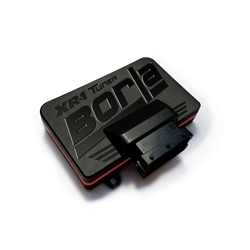 And now BORLA is excited to announce a new product line-up with the introduction of the XR-1 Tuner. The XR-1 Tuner is intended for racing use only and will enhance the performance gains seen by BORLA’s exhaust products, further increasing the power and torque available from your vehicle. The XR-1 Tuner is designed for DIY installation and includes stainless steel mounting brackets specifically for this application, as well as a custom wiring harness and easy-to-follow, step-by-step instructions. On track, you’ll immediately appreciate the gains from the XR-1 Tuner. With the device installed on the Ford Mustang 2.3L EcoBoost, our R&D team in Oxnard, CA was able to record improvements of up to 70 lb/ft of torque and 40hp.